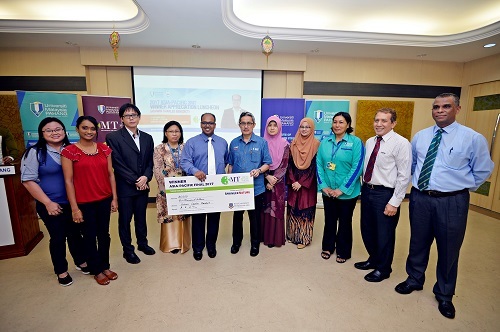 Graduate Research Scheme (GRS) was introduced in 2013 to provide financial assistance to full-time Master and PhD candidates in Universiti Malaysia Pahang. This scheme is an acknowledgement from the University for the excellent academic performance of the candidates and to encourage creative and innovative research outcomes. On 30th December 2016, Postgraduate Studies Council has decided to rebrand the term GRS to Doctoral Research Scheme (DRS) and Master Research Scheme (MRS). No other scholarship has been awarded whether Working Student Scheme (SPB), Research Assistant (RA), Graduate Research Assistant Scheme (SPSS), or scholarship from MARA, JPA, and others. The candidate is eligible to apply if the appointment as SPB or SPSS is near completion during the time of DRS or MRS application. Please indicate the appointment date as well as the terms and conditions for SPB and SPSS in the interview form. Academic requirements: A Bachelor’s degree with Honours or equivalent with a minimum CGPA of 2.75. Priority is given to candidates who are active in co-curricular activities. Academic requirements: A Bachelor’s degree with Honours or equivalent with a minimum CGPA of 2.75 AND a Master’s degree with Honours or equivalent with a minimum CGPA of 3.00. Priority is given to applicants who were active in co-curricular activities. Local students will only be permitted to hold one scholarship. Applicants must be a local and in their final year of Bachelor’s degree in Universiti Malaysia Pahang. Academic requirements: A Bachelor’s degree with Honours or equivalent with a minimum CGPA of 3.00. Local students will only be permitted to hold one scholarship of either MyBrain or MRS ‘Jom Sambung Master’. Prior to applying for MRS, applicants must perform an online application for postgraduate enrolment via http://ips.ump.edu.my. Applicants with active engagement in co-curricular activities. Potential supervisors with active involvement in research (grant acquired) and publication. Applicants must complete the application form Form 3: Application for DRS and MRS Faculty Local & International Slots). Upon application completion and IPS verification, an interview session for evaluation will be done at faculty level. Upon application completion and IPS verification, an interview session for evaluation will be done by IPS. Short-listed applicants of each faculty must not exceed the maximum nomination of four (4) applicants. An offer letter will be issued to the successful applicants after the approval of the Vice Chancellor. All documents and forms must be submitted to faculty before shortlisted. 4.0 What Are The Benefits? -Maximum appointment and funding for Master’s Degree is up to 2 years. -Maximum Appointment and funding for Doctoral Studies is up to 3 years. -Tuition and Exam Fees are not covered.